Mutations in the MSH2 gene cause Lynch syndrome. Men and women with a mutation in MSH2 have a 52-82% lifetime risk (up to age 70) to develop colon or rectal cancer. Moreover, this syndrome is associated with a 30% risk of a second colon or rectal cancer appearing within 10 years of the first colon cancer. It is important to note that colorectal cancer risk remains higher after age 70. Women also have a 25-60% lifetime risk for endometrial cancer and 4-13% lifetime risk for ovarian cancer (up to age 70). 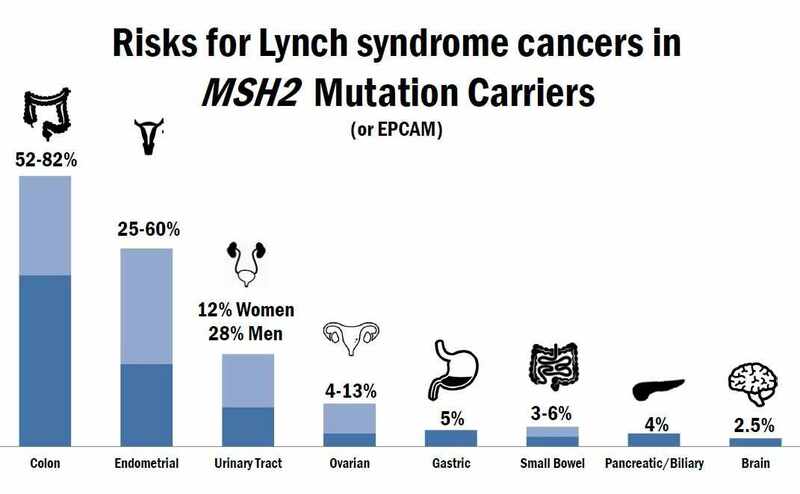 People with Lynch syndrome are also at increased risk for other cancers that include cancer of the stomach, urinary tract, ovaries, small intestine, pancreas or bile ducts, sweat glands, and brain. Several hundred mutations in the MSH2 gene that predispose carriers to colorectal, endometrial and other Lynch syndrome-associated cancers have been found. These mutations may cause the MSH2 gene to stop producing the normal protein, and to produce the wrong protein or no protein at all. When the MSH2 protein is absent or abnormal, the number of mistakes that are left unrepaired during cell division increases substantially. If the cells continue to divide, errors accumulate in DNA and the cells become unable to function properly and may form a tumor in the colon, endometrium or another part of the body. Mutations in the MSH2 gene are inherited in an autosomal dominant pattern, meaning each first-degree relative, such as sibling or child, has a 50% chance of having inherited this mutation, and genetic testing is recommended for adult relatives. Mutations in MSH2, when inherited from both parents, cause Constitutional Mismatch Repair Deficiency (CMMRD), a condition that usually presents in childhood and is associated with a high risk of cancer. If both partners have a MSH2 mutation, each child has a 25% chance of inheriting both mutations, which causes CMMRD. For this reason, anyone with an MSH2 mutation who may be having children should have his or her partner tested to see if he or she also carries an MSH2 mutation. Colon and Rectal (Colorectal): FULL Colonoscopy at age 20-25y or 2-5y prior to the earliest colon cancer if it is diagnosed before age 25y and repeat every 1-2y. Stomach/Upper GI EGD (to be done at the time of the colonoscopy) depending on center of care. Selected individuals with a family history of gastric, duodenal, or more distal small bowel cancer may have increased risk and may benefit from screening. Individuals of Asian descent may have increased risk for stomach cancer and may benefit from screening. If screening is done, consider upper endoscopy with visualization of the duodenum and the time of colonoscopy every 3-5 years starting at age 40. Consider H. pylori testing and treatment if detected. Uterus (Endometrial) Discuss limitations of endometrial cancer surveillance. Know the signs and symptoms like abnormal vaginal bleeding. Risk-reducing hysterectomy and salpingo-oophorectomy (RRSO) are options when childbearing is complete or not desired, ideally by age 40. Follow high-risk RRSO protocol for surgery and pathology. Ovarian Discuss limitations of ovarian cancer surveillance. Symptoms of ovarian cancer include persistent (>2 weeks) of abdominal bloating, changes in bowel habits, frequent urination, or early satiety. Bladder and Ureter If there is a family history of bladder and/or ureter cancer, offer surveillance with urine cytology and urinalysis (with micro) every year from age 30, including discussion of benefits and limitations. Routine cystoscopy is not indicated, if the results of these tests are normal. Central nervous system Consider annual physical/neurological eamination starting at 25-30. No other recommendations have been made. Pancreatic Dependent on care center. No national guidelines or protocols. Patients can consider clinical trials and research studies for pancreatic cancer screening. Breast and Prostate Not enough increase in risk to recommend additional screening at this time. Skin Dermatology exam from age 25 once a year. Skin self-exam and report new lesions to doctor. Aspirin may decrease risk, but optimal dose and duration are uncertain. Talk to gastroenterologist for discussion of personal risks and benefits. Oral contraceptives lower the risk of ovarian cancer by 50% when taken for 3-5 years and also lower endometrial cancer risk. Depo-medroxyprogesterone acetate (depo Provera) and Levonorgestrol (Mirena) intrauterine system may also be used for endometrial cancer risk reduction.